Saturday night… 9.30pm… Royal Academy in Picadilly… and it’s buzzing with people of all ages, nationalities and classes, all vibed at the prospect of viewing David Hockney’s A Bigger Picture. There’s been a rake of media publicity around Hockney’s work of late and it’s clearly reflected in the queues round the block at the Royal Academy and the tiny window for on-line tickets. Guaranteed to stoke the fires of controversy was an impish diss, aimed at Damien Hirst, whereby Hockney included the line, “All the works here were made by the artist himself, personally”, on the posters promoting his exhibition. That said, he is undoubtedly an affable fellow and a serious grafter who is passionate about his craft. As a painter has definitely endeared himself to both the media and public who are at one with his exuberant celebration of the Yorkshire countryside. Hockney is more hip than ever and not surprisingly his “slouchy… disheveled cool” has earned him style icon status. 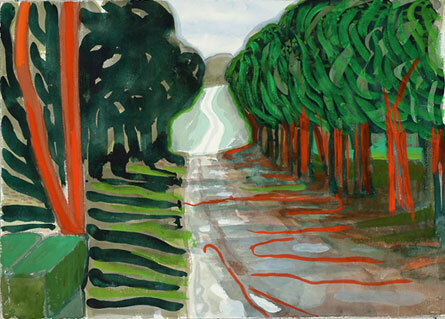 Hockney was born in Yorkshire but is a long-time resident of LA. Over the past couple of decades it’s his relationship with his photographer sister, Margaret, and his now deceased friend, Jonathan Silver, who initiated the 1853 Gallery in Saltaire, that has consistently drawn him back to his birthplace. 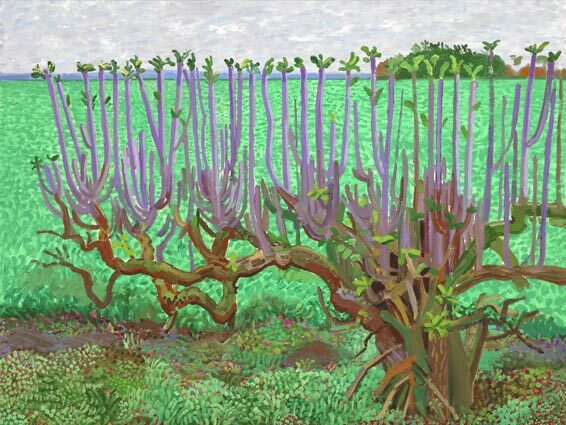 This is a huge show and David Hockney, at 74, is nothing less than prolific. It made me jealous and today, makes me think, why am I sitting here writing this when I could be creating something of my own. Maybe, I’m just reflecting on lessons learned. This exhibition gives us intimate access to the process involved in creating these works and Hockney wear his influences on his sleeve…. for example, think Vincent Van Gogh. There’s a couple of rooms with earlier works including the Grand Canyon paintings and the photographic collages but we’ll skip over that and get down to the meat & potatoes and start with an impressive couple of walls of small oil paintings and gouaches. 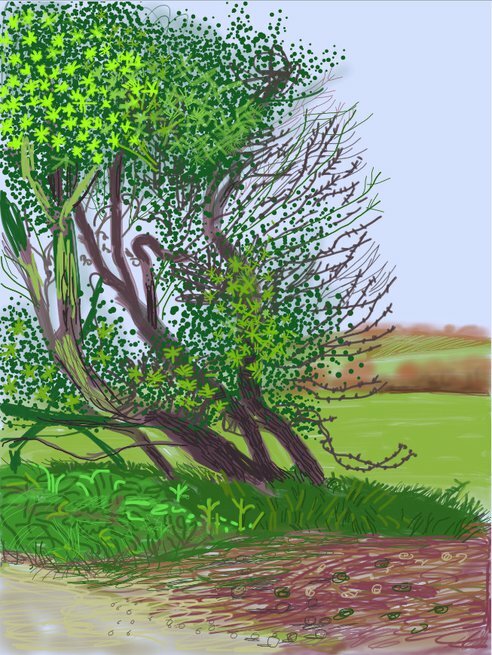 'The Arrival of Spring in Woldgate, East Yorkshire in 2011 (twenty eleven)'. Along with deciphering the techniques of the old masters Hockney has extended his romance with new technology by producing a room full of “paintings” done on his ipad. I had to agree with a perceptive fellow viewer that they lacked the resonance of the oils and it would have been interesting to see some of them back lit, as on the ipad. Nit picking aside, the overall impact of his inkjet prints was impressive and the techniques employed thought provoking. How could you not be tempted to buy an ipad and treat it as a sketchbook after seeing this show? In fact, you should, after seeing his real sketchbooks, have both! Hockey is an artist/craftsman equally at ease with the rigorous demands of the fine art tradition and the rapidly evolving digital age and I love that. Maybe I was on overload by the time I encountered the room of paintings where he interprets Claude Lorrain’s 1656 painting, Sermon On The Mount. 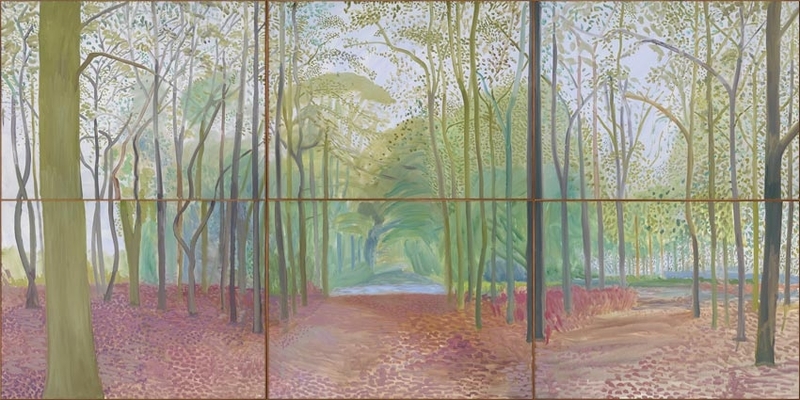 Sadly, despite Hockney’s enthusiasm for this painting, which he has “restored”, his efforts simply washed over this viewer and as I stepped into the darkened room showing his split screen films I was ready to take the weight of my feet. 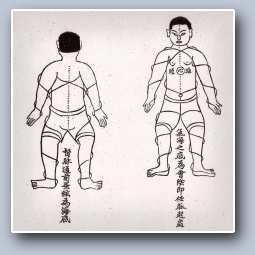 Unfortunately, all the seats had been taken, curtailing one’s ability to relax and indulge in what has clearly become another dimension in the process. I’d like to see this show again simply because the scale of it all doesn’t translate into a catalogue or a pack of postcards. But if I can’t, then I’ll have channel the inspiration and energy I felt upon leaving the Royal Academy and get busy with the sketch book and replace those dried up tubes of paint. Now, there’s a thought! For the word from the man himself check the video below or tune to BBC iplayer and check the interview with Andrew Marr. This entry was posted in Deep stuff and tagged 1856 Gallery, A Bigger Picture, Art, Claude Lorrain, Damien Hirst, David Hockney, ipad, Landscapes, painting, Royal Academy, Saltaire, Yorkshire Dales. Bookmark the permalink. Hi Paul. A pleasure to read this review and see the images. I smile in the hope that now at last we may have turned a corner away from all that cynical, cerebral, “lust-less” conceptualism which has hi-jacked the whole visual art scene since about 1993. 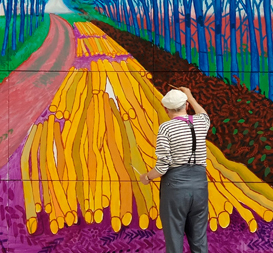 Yes Hockney has made himself a figurehead for all that is human, honest (and humanist) in art. As a struggling ‘creative’ myself, i do really resent the ‘celebrity-status’ of charlatans and plagerist-marketing men who spoonfeed us their ‘groundbreaking’ artworks (a pretentious and undefendable claim in itself). But I don’t resent Hockney’s success in the least. He is a lovable, hardworking rogue in every sense. And it is always a delight to be among a room full of his pictures, or to listen to him speak about his own or other art on TV. His work embodies a unity betweeen ‘the heart, the head and the hand’ He’s a 3-dimensional hero of an old-fashioned but lasting kind. And if this is a ‘sea-change’ then bring it on because its well-overdue. Thank you Mr Hockney. By the way, here’s a bit of reader/user info.And a question for the Blog organisers- It is really easy to leave a comment about articles on this blog. But when I tried to ‘like’ the blog, all kinds of security barriers are thrown up. It repeatedly rejected my password and username. Why should it be so hard to ‘like’ yet be so easy to comment? No passwords were asked when I left my comment. I cant understand why all these security barriers are needed at all in this context? Yep I get it – makes me want to go thanks !